Social media refers to web or mobile-based technologies that allow the creation and exchange of user-generated content. Loosely termed Web 2.0, these platforms are characterized by two-way communicability that enhances interaction between two or more individuals and indeed, potentially massive communities. The various categories – including collaborative projects like wikis; blogs and microblogs like Twitter; social networking sites like Facebook; content communities like Instagram; and virtual social worlds such as second life – have become a ubiquitous feature in the everyday lives of individuals, organizations, and corporations. Among various other applications, social media have found widespread use in education thereby constituting a form of technology-enhanced learning (TEL). Dao highlighted participation, openness, conversations, communities, and connectedness as properties which make social media sites suitable for use as online instructional environments. Nigerian tertiary institutions generally lack the infrastructure required for effective TEL, and the presence of online/e-learning services is limited to only a few universities. The prohibitive costs of procuring and maintaining learning management systems for online learning in universities make free, online social media applications a cost-effective substitute in resource-poor settings., Social media use is beneficial to the learner because it can be synchronous or asynchronous; it enhances interaction; it promotes collaboration; and it grants access to educators beyond class time and office hours. Scholarly enquiry into the adoption of social media in medical education is an emerging field. There is a vast body of anecdotal evidence emanating from the developed countries pertaining to the use of social media for delivery of educational content across the continuum of medical education.,,,,,,,, Pathologists have lagged in the adoption of this innovation, but in the last few years, the potential of social media in furthering the goals of pathology education has become apparent, especially in the United States of America (USA)., Although African pathologists have also embraced the use of social media, emphasis has been on interaction and collaboration with other pathologists rather than a concerted effort to deploy the tool in education. Nigeria has the highest number of internet users in the continent. The heaviest use of social networking sites is recorded among users in the 18–34-year age bracket, the demographic to which undergraduates frequently belong. In addition, it has been demonstrated that Nigerian medical students are disposed to the integration of emerging ways of teaching pathology into existing frameworks. The aforementioned observations beg the question as to why pathology educators are not utilizing social media strategically. Successful implementation of technologies in education requires an understanding of student's preferences and motivation for using such technologies because these determine whether the said technology will be accepted or rejected. To this effect, this study assessed 4th year medical and dental students' access to internet services, their social media presence, their motivations for using social media and their willingness to accept being taught by pathology lecturers using this medium. The implications of the findings on leveraging social media for pathology education are discussed. The study was a cross-sectional descriptive study conducted among two successive sets of 4th year medical and dental students in the pathology/pharmacology class. The two sets were comprised of 227 students: 124 students (102 medicals and 22 dentals) in the 2015/2016 set and 103 (85 medicals and 18 dentals) in the 2016/2017 set. A paper-based survey was conducted using a self-administered and semi-structured questionnaire. Participation was voluntary after explaining the objectives of the survey to prospective respondents. Students were assured that nonparticipation would not result in any sort of discrimination or penalty. The questionnaire was made anonymous to avoid disclosing respondents' identities. The survey instrument was developed based on a review of related literature. It was pretested in a pilot survey involving 40 medical/dental students and adjusted, based on feedback, for clarity and content. The final questionnaire consisted of four sections: demographic characteristics; internet usage; awareness and pattern of social media use; and perceptions about the use of social media for pathology education. Data were analyzed using SPSS version 21 (IBM, New York, USA) and presented in tables and charts. Variables were compared using Pearson's Chi-square test. The statistical significance level was set at P = 0.05. The response rate was 74.4% (169 respondents). Respondents consisted of 119 males (70.4%) and 50 females (29.6%). Their mean age was 23.2 ± 3.6 years with a median age of 22 years and a range of 17–46 years. The age distribution of respondents is shown in [Figure 1]; most were <25 years of age (79.3%). Of all respondents, 98.2% had regular access to the internet. One-hundred and sixty-six respondents (98.2%) own at least one device with which they can access internet services: 67 (39.6%) own a tablet, 82 (48.5%) own a laptop computer, and 136 (80.5%) own a smartphone. Respondents bear the cost of using the internet by purchasing data from various service providers. One hundred and thirty-three (80.1%) could estimate their average monthly data consumption as depicted in [Figure 2]. All respondents were aware of social media. The question “What do you understand by social media?” was open-ended and analyzed qualitatively. 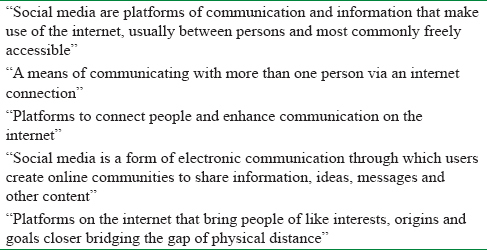 The commonest words used to describe social media were “communication,” “interaction,” and “connection.” All descriptions contained the word “internet.” Sample responses are presented in [Table 1]. All respondents had registered presence on at least one social media platform. 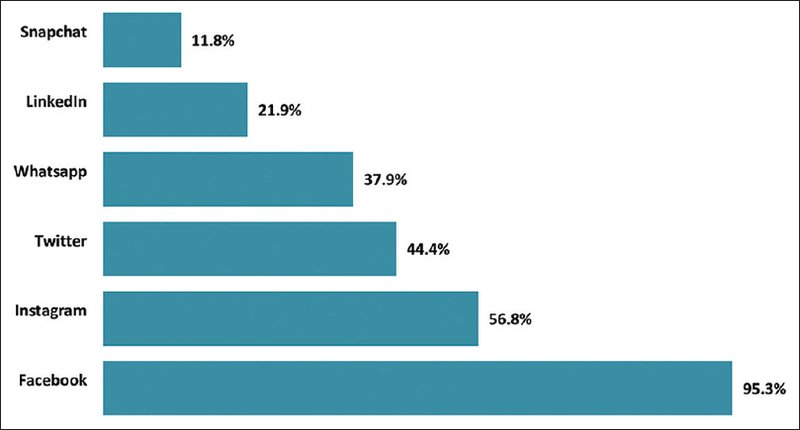 [Figure 3] shows the most popular social media sites among respondents. Other social media platforms to which respondents subscribed were Pinterest (4.7%), BlackBerry messenger (3.6%), YouTube (1.8%), Telegram (1.2%), WeChat (0.6%), 2 go (0.6%), and Reddit (0.6%). [Figure 4] shows the frequency of use of the most popular social media platforms. [Table 2] shows the prevalence of use of the three most popular social media platforms according to age group and gender. Significant association was found between Instagram use and age group, being most popular among those <25 years of age. Likewise, Facebook use was associated with gender, being commoner in male students [Table 2]. 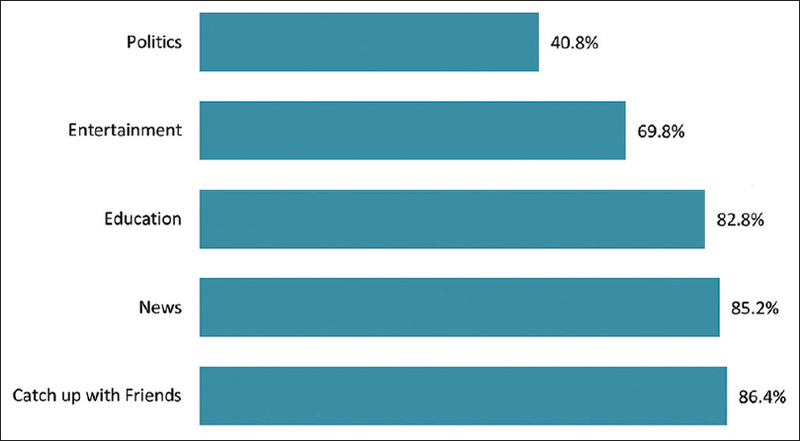 The reasons why respondents use social media are shown in [Figure 5]. Facebook (84.0%), Instagram (57.4%), and Twitter (36.7%) were identified by respondents as the social media platforms that could serve as vehicles for medical education. 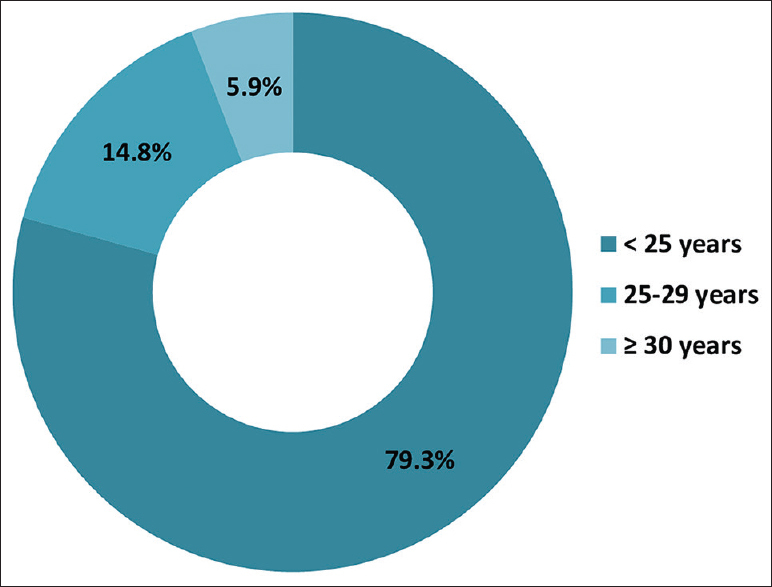 One hundred and thirty-nine respondents (82.2%) deliberately access content relevant to their medical education on social media. Of these, 108 (77.7%) like and follow educationally relevant Facebook pages, 67 (48.2%) follow an Instagram account that shares medically related content and 21 (15.1%) follow Twitter accounts dedicated to medical education. The nature of this content includes text (81.3%), links to articles (69.1%), videos (58.3%), quizzes (39.6%), and pictures with descriptive legends (35.3%). One-hundred and three (74.1%) affirmed that some of the content was pathology related. One-hundred and sixteen respondents (68.6%) said they would like their pathology lecturers to engage and provide instruction through social media. There was no association between age and the acceptance of this proposition (χ2 = 0.173, P = 0.917). Those respondents who accessed medical education content on social media were more disposed to lecturers delivering content through social media platforms (χ2 =5.154, P = 0.015). [Table 3] shows the distribution of perceived barriers and drawbacks to the use of social media for pathology education. Social media use among Nigerian undergraduates has been previously assessed by various researchers, but none has focused on medical and other health professions students.,,,,, Furthermore, this study is centered on exploring opportunities to use social media as a tool for pathology education while others concentrated on the relationship between the use of social media and academic performance. The results of this survey will be useful to innovative pathology educators willing to become leaders in a domain that constitutes uncharted territory in the Nigerian medical education landscape. All survey respondents were aware of social media with registered presence on at least one social media platform. This is similar to the findings from a survey in a Turkish Medical School. Facebook (95.3%) was the most popular social media site used by respondents. This aligns with observations from similar surveys in the United Arab Emirates (93.5%), Turkey (95.3%), and USA (95%).,, Indeed, with 2 billion active monthly users, Facebook has the largest user base of any social media platform in the world. Since most students use this platform, it may be suitable to leverage it for pathology education. El Bialy et al. described the use of Facebook to complement anatomy education with optimal participation among students. 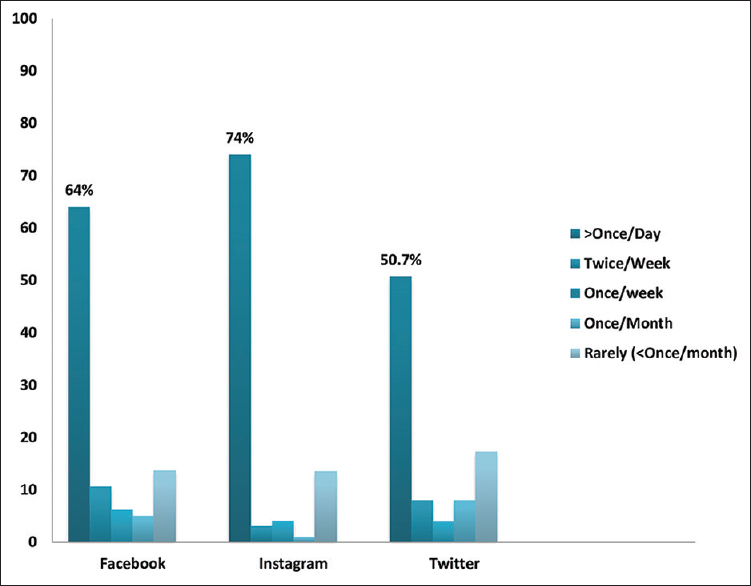 Instagram was another popular social media site among respondents in this survey. There was an association between Instagram use and age group with more users belonging to the <25 years category, the predominant age group in this cohort. This photo-sharing application is infrequently mentioned in the medical education literature. However, it is increasingly popular among individuals 18–24 years and has been successfully used for medical education in image-centered disciplines such as radiology and dermatology., This implies that it may be suitable for teaching undergraduates pathology which revolves largely around images (at least in anatomic pathology, hematology, and medical microbiology). Over 80% of respondents in this survey used social media for academic purposes. While Alsuraihi et al. and Wickramanayake and Jika reported similar observations, Ezeah et al. and Anyanwu et al. had opposing views.,,, In a meta-analysis of 10 studies conducted between 2007 and 2013, Guraya found that only 20% of medical and other health professions students used social media to augment education. These divergent findings may be an effect of the period during which the respective studies were conducted. Over time, more students have begun taking advantage of the potential of social media for education. Hence, studies reported in the last 3 years tend to posit that students use social media for educational purposes in addition to more social uses such as communicating with family and friends. Close to 70% of the students found the idea of lecturers teaching and interacting with them through social media acceptable. 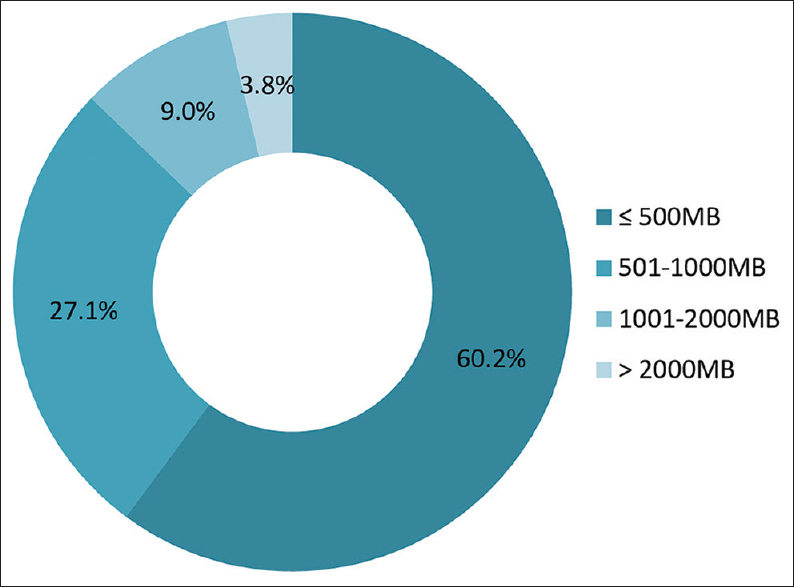 This gives a crude estimate of the expected uptake of the innovation. Acceptance was associated with students who already accessed medical education on social media. Due to the large number of subscribers and the open nature of social media, it is often difficult to ascertain the quality or accuracy of educational content. Students can be assured of the authenticity of the information they consume when their lecturers engage and teach in the social media niches they use frequently. Quality assurance can also be guaranteed by students following renowned subject matter experts, agencies and professional organizations such as Centre for Disease Control and World Health Organization. Pathology educators can serve as digital guides nudging students towards these reliable sources. The reasons why some respondents did not want their lecturers to teach and interact with them via social media may be inherent in the perceived drawbacks to using social media. Most respondents perceived the tendency for distraction from other feeds when using social media as a barrier to its effective use for education (66.3%). This is similar to students' perception in a recent Canadian survey (62%). Anchoring, the ability to stay focused on important tasks while undergoing a deluge of distractions, is a key skill needed for learning in an online environment. Students can be given tips to develop this skill. For example, the use of notifications can be reserved for educational posts alone as an effective way of minimizing distractions. Also, the creation of Interest Lists on Facebook is a feature which provides direct and timely access to Facebook pages of interest without the inherent distraction that arises while going through entire timelines. The lack of institutional support in terms of internet facilities was perceived as a problem by only 20% of respondents. This is understandable because private internet usage in Nigeria has risen as a result of the increasing use of smartphones which have become more accessible to young and educated members of the population. Mobile internet use has become pervasive with telecommunication companies offering broadband access and data bundles that are within the reach of various socioeconomic strata. As a testament, 80.5% of respondents accessed the internet using their mobile phones with average monthly data consumption ranging from <500 MB to as much as 2 GB. Few students perceived breach of professionalism as a drawback of using social media for education (13.6%). This may be due to students being ignorant about issues of ethics and professionalism. A survey in Turkey suggested that undergraduate medical students are unaware of ethical concerns posed by social media use. According to Belean and Truong, 30% of professional violations are linked to patient confidentiality and include divulging patient identifiers in text or images. Both students and educators are vulnerable to this kind of professional misconduct. Educators wishing to use social media as a forum for teaching should be grounded in ethics and professionalism. They should also take up the responsibility of providing guidance for students. Institutions and professional bodies should issue policy statements promoting ethically sound use of social media. The single-institutional nature of the study may affect its generalizability. Social media use amongst medical and dental undergraduates is pervasive, mostly through mobile smartphones. Many already access medical education, some of it pathology related, on these platforms and are willing for their lecturers to teach them via social media. Social media is, therefore, a potential tool for the delivery of pathology education that transcends the boundaries of space and time. Facebook, being the most widely used platform, may be appropriate for integrating social media into medical education. Instagram may be especially suitable for pathology education because of its image-centered nature. There is no buying without selling; therefore, the manner in which pathology educators utilize social media, their willingness, and capability to integrate it into teaching pathology should be equally assessed. University administrators and innovative pathology educators can use survey results to integrate modern technologies with existing curricula. Institutional guidelines should be put in place to steer interactions and safeguard against breaches in ethical and professional conduct. In addition, the impact of these innovations on student learning should be assessed. Dr. Nwogoh Ben assisted with statistical analysis. Kaplan AM, Haenlein M. Users of the world, unite! The challenges and opportunities of social media. Bus Horiz 2010;53:59-68. Dao DV. Social media classification scheme in online teaching and learning activities: A consideration for educators. Int J Educ Soc Sci 2015;2:85-94. Siemens G, Tittenberg P. Handbook of Emerging Technologies for Learning; 2009. Available from: http://www.elearnspace.org/Articles/HETL.pdf. [Last accessed on 2018 May 28]. Egoeze F, Akman SM, Colomo-Palacios RC. An evaluation of ICT infrastructure and application in Nigerian Universities. Acta Polytech Hung 2014;11:115-29. Wickramanayake L, Jika SM. Social media use by undergraduate students of education in Nigeria: A survey. Electron Libr 2018;36:21-37. Nickson CP, Cadogan MD. Free open access medical education (FOAM) for the emergency physician. Emerg Med Australas 2014;26:76-83. Carley S, Beardsell I, May N, Crowe L, Baombe J, Grayson A, et al. Social-media-enabled learning in emergency medicine: A case study of the growth, engagement and impact of a free open access medical education blog. Postgrad Med J 2018;94:92-6. Goyal A, Tanveer N, Sharma P. WhatsApp for teaching pathology postgraduates: A pilot study. J Pathol Inform 2017;8:6. Timothy PG, Jeffrey B, Kaitlyn L, Margarita VD. Delivery of educational content via Instagram®. Med Educ 2016;50:575-6. Manca A, Lafferty NT, Fioratou E, Smitheies AD, Hothersall EJ. Integrating Twitter into an undergraduate medical curriculum: Lessons for the future. In: Greener S, Rospigliosi A, editors. Leading Issues in Social Media Research. Sonning Common, England: Academic Conferences and Publishing International Limited. ; 2015. p. 121-38. Camm CF, Sunderland N, Camm AJ. A quality assessment of cardiac auscultation material on YouTube. Clin Cardiol 2013;36:77-81. Galiatsatos P, Porto-Carreiro F, Hayashi J, Zakaria S, Christmas C. The use of social media to supplement resident medical education – The SMART-ME initiative. Med Educ Online 2016;21:29332. George DR, Dellasega C. Use of social media in graduate-level medical humanities education: Two pilot studies from Penn State College of Medicine. Med Teach 2011;33:e429-34. El Bialy S, Jalali A, Jaffar AA. Integrating Facebook into basic sciences education: A comparison of a faculty-adminstered Facebook page and group. Austin J Anat 2014;1:1015. Fuller MY, Mukhopadhyay S, Gardner JM. Using the Periscope live video-streaming application for global pathology education. A brief introduction. Arch Pathol Lab Med 2016;140:1273-80. Gonzalez RS, Amer SM, Yahia NB, Costa FD, Noatay M, Qiao JH, et al. Facebook discussion groups provide a robust worldwide platform for free pathology education. Arch Pathol Lab Med 2017;141:690-5. Royall J, Isyagi MM, Iliyasu Y, Lukande R, Vuhahula E. From access to collaboration: Four African pathologists profile their use of the internet and social media. Clin Lab Med 2018;38:53-66. Available from: https://www.internetworldstats.com/stats1.htm. [Last accessed on 2018 May 28]. Smith A, Anderson M. Social Media Use in 2018. Pew Research Centre; 2018. p. 1-17. Available from: htpp://www.pewinternet.org/2018/03/01/social-media-use-in-2018/. [Last accessed on 2018 May 20]. Vhriterhire RA, Orkuma JA, Jegede OO, Omotosho AJ, Adekwu A. Technology-enhanced pathology education: Nigerian medical students' perspectives. J Educ Pract 2016;7:103-8. Guo Z, Li Y, Stevens KJ. Analysing students' technology use motivations: An interpretive structural modeling approach. Commun Assoc Inf Syst 2012;30:14. Anyanwu EU, Ossai-Onah VO, Iroeze P. Use of social media tools among Nigerian undergraduates in three selected tertiary institutions in Imo state, Nigeria. J Inf Knowl Manag 2013;4:46-51. Enikuomehin OA. ICT, CGPA: Consequences of social networks in an internet driven learning society. Int J Comput Trends Technol 2011;2:9-14. Fasae JK, Adegbilero-Iwari I. Use of social media by science students in public universities in Southwest Nigeria. Electron Libr 2016;34:213-22. Ogedegbe PM, Emmanuel JA, Musa Y. A survey on Facebook and academic performance in Nigerian universities. Int J Eng Res Appl 2012;2:788-97. Ezeah GH, Asogwa CE, Obiorah EI. Social media use among students of universities in South-East Nigeria. IOSR J Humanit Soc Sci 2013;16:23-32. Avcı K, Çelikden SG, Eren S, Aydenizöz D. Assessment of medical students' attitudes on social media use in medicine: A cross-sectional study. BMC Med Educ 2015;15:18. Al Wahab A, Al-Hajo S, AlAhmdani G, Al-Mazroua N, Edan M, Nugud S, et al. The patterns of usage and perceived impact of social networking sites on medical students' education. J Nurs Healthc 2016;1:1-4. Kind T, Genrich G, Sodhi A, Chretien KC. Social media policies at US medical schools. Med Educ Online 2015;15. doi:10.3402/meo v15i0.5324. Ranginwala S, Towbin AJ. Use of social media in radiology education. J Am Coll Radiol 2018;15:190-200. Alsuraihi AK, Almaqati AS, Abughanim SA, Jastaniah NA. Use of social media in education among medical students in Saudi Arabia. Korean J Med Educ 2016;28:343-54. Guraya SY. The usage of social networking sites by medical students for educational purposes: A meta-analysis and systematic review. N Am J Med Sci 2016;8:268-78. Adesoji A. Mobile technology, social media and 180 million people. J Bus Adm Manag Sci 2017;6:82-5. Belean G, Truong J. Social media and medical students. Med Stud J Austin 2011;3:21-3.